The Adolescent Demo Division are the world’s luckiest teen gamers. Raised from birth to test media, appear on reality TV and enjoy the fruits of corporate culture, the squad develop special abilities that make them the envy of the world–and a grave concern to their keepers. 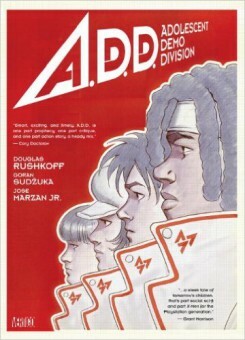 “Douglas Rushkoff’s graphic novel debut,“A.D.D.” (Adolescent Demo Division) is a tight, action-packed comic wrapped around a serious, thought-provoking critique of the commodification of youth culture. The titular ADD is a squad of specially trained young video-game champs who are worshipped as teen idols. But while the lives of the ADD are outwardly full of glamor, and while they get all the video games they can play, they lead lives of intense misery. Hypercompetitive, locked away in a high-security compound, manipulated by the adults around them, the ADD live their lives in anticipation of “levelling up,” a mysterious graduation that takes their best and brightest away to some unknown (but presumably wonderful) next life. And of course, things aren’t what they seem — the corporation that runs ADD isn’t merely an entertainment conglomerate, they have a secret agenda that’s all about learning better ways to manipulate and control consumer culture. The details of this plot unfold to the dissident ADDers as well as the reader through a series of ever-more-deadly adventures.